Let’s drill deeper down to the roots of an effective campaign. We’ve uncovered what petitions are and why they are more relevant than ever, along with which causes are best served by petitions. Now let’s work to make your petition the best it can be! A successful petition defines both clearly! Here’s an example. This petition regarding the sale of puppies at flea markets nationwide identifies both the target and the base of support. A well-crafted petition names an individual or small group to whom we want to direct our concern or request. In the puppy petition, the target is the President of the National Flea Market Association, Robert Sieban — the person with the strongest influence over flea markets, and thus, the power to stop puppy sales. How do we find the best targets? Look for individuals within an organization that have the power to listen and help. Many petitions have a target of just one individual with the power to make decisions. A little research into the company or group you are targeting goes a long way! Remember that if your issue covers multiple companies or governments, online petitions are easy to replicate with unique targets for each group. Our example petition can easily be replicated to target the managers of local flea markets as well. Presidents and CEOs are likely targets of petitions because they have a broad understanding of the operations, both in how they function currently and the process for change. HOWEVER, not every petition is best served by solely targeting the head of an organization. We look for those that are in charge, and also those in the best position to help. That means we look at all rungs on the ladder: PR representatives, local managers or affiliates, franchisees and boards of directors can all be effective targets. Government officials are prime targets for petitions. When dealing with government, think big and start small. 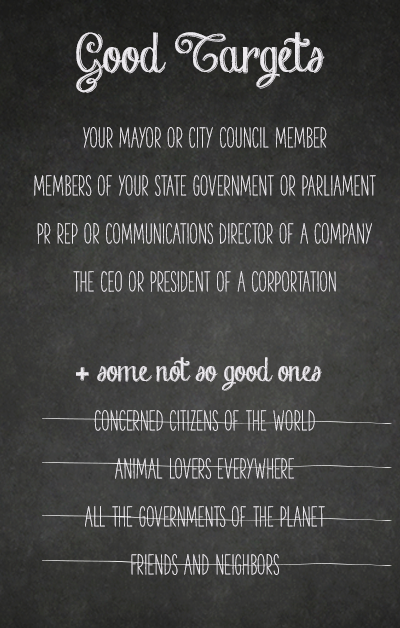 Start by targeting municipal, city and county leaders before national representatives. Any good petition needs support! People need to know what the issue is and why it’s important. Use any creative way you can think of to get people listening and engaged. In the puppy sales petition, the ‘public’ consists of Humane Society supporters, both current and future. Share your personal story. The best petitions are those created by someone directly affected by their issue. Using your own experience and connection to the cause, others will be motivated to join in support, or at least begin to learn more. Spreading the word through neighborhood and community message boards and social media groups can easily drum up support in your area. 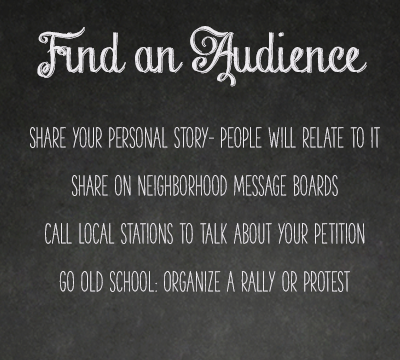 Online news outlets also love to cover local issues, so gather contacts before launching your petition and do some traditional PR outreach. Remember, online petitions are easy to share with family and friends both near and far. Create a plan for distribution before you publish your petition. Go old school! Create a rally in front of government or business headquarters. This draws press attention and interviews, raises awareness of your issue, and creates a visual image to go along with your message. In our puppy sales example, an awareness campaign DURING a major flea market calls immediate attention to an animal rights issue that’s hard to ignore. We’ll go into more detail about this in a future post, so stay tuned. The goal of any campaign is to create awareness for change. As you create your petition, keep both your target(s) and your supporters in mind, with easy calls to action for progressing the issue toward a resolution. Need help framing your message and calls to action? Read on in part four of our series, as we work to create the strongest message possible!